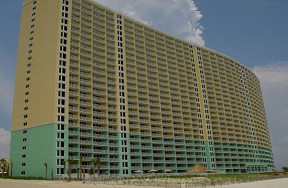 Property Info: 1BR, 2BA beachfront condo with 930+ sq. ft.
Panama City Beach has an abundance of activities and attractions; popular theme parks include Gulf World Marine Park, offering swimming with dolphin experiences, and Shipwreck Island Waterpark, featuring water-slides and pools. St. Andrews State Park is one of 2 protected nature preserves nearby. Find the perfect vacation rental home for your beach vacation! Panama City Beach is a popular waterfront resort town and vacation destination in northwestern Florida, It’s known for miles of sandy beaches fronting the Gulf of Mexico. As of the 2010 census it had a population of 12,018. This is a variety of Florida resort properties and real estate investments, from beachfront condominium homes, to cottages and houses with boat-slips.